Shooting mat, roll up padded design. Dimensions are: 69" x 35" and 19.5" x 8.5" when rolled up. Slip resistant panels at the knee and elbow. Tan, Dark earth color, constructed of heavy PVC nylon material. Can be used for multiple purposes besides as a shooting mat, such as padding under a sleeping bag when camping, or rolled up as a pillow. By VISM NcStar. MFG part# CVSHMR2957T. New. These are well made with nice heavy weight cloth. 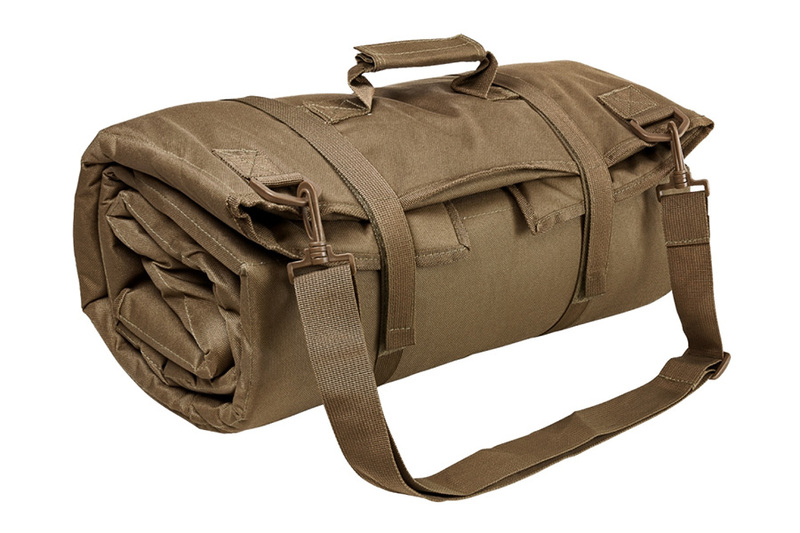 I am pleased with the shooting mat its light weight and roll up with straps and handle make it very easy to carry out to a range or a shooting spot anywhere. It appears rugged and tough should last awhile. Seems to be well made for what I paid for it. Very light also. Good Deal. They are made very well.